For more information on these options, please refer to our Oversized Reports FAQ. Once an inspection has been successfully submitted or previewed, PIM will save a finished copy in the Inspection Reports Folder. Step 1: Make sure you are in the Inspection Home screen for the correct property then tap the Report Folder icon at top of the screen. Step 2: Locate the correct report then tap Options to see sharing options. For more information on this option, please refer to our Sharing Reports and Photos from PIM guide. 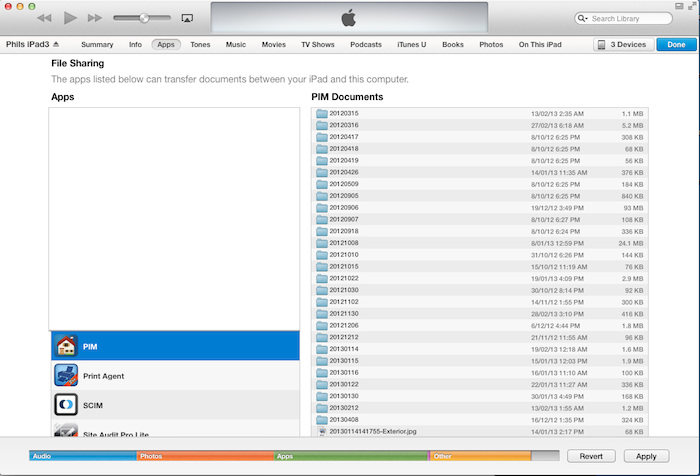 With PIM being an iPad app you can always access your reports and photos directly from iTunes. Depending on which version of iTunes you are running on your PC/Mac just follow our instructions below. Plug your device via USB. Tap on the iPad icon in the top left-hand corner of iTunes, at the end of the music, video icons etc (See Diagram below: iTunes v12 - Select iPad). Then choose the Apps tab (on the left of the screen) (See Diagram below: iTunes v12 - Click Apps). Scroll down to File Sharing section. Select your relevant directories and click on the “Save To…” button (you may need to scroll down to see this button) and then with the new window that is displayed select the area you would like to save the files to and click "Save To" Or "Select Folder". Your reports and photos will be saved into that area on your PC/Mac. Or directly drag & drop documents from the list to the desktop on your PC/Mac. The reports are structured according to Inspection Date/Address for each Inspector. 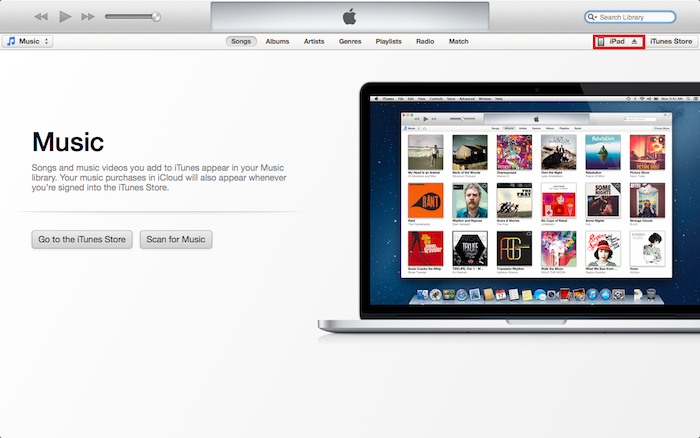 Tap on the iPad icon in the top right hand corner of iTunes (See Diagram below : iTunes v11 File Sharing - Select iPad). Then choose the Apps tab (at the top of the screen). Select your relevant directories and click on the “Save To…” button or directly drag & drop documents on the list to your PC/Mac. The reports are structured according to Inspection Date/Address for each Inspector.